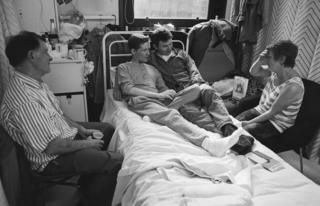 Opened in 1987 by Diana, Princess of Wales, the Broderip, at the Middlesex Hospital, was the first Aids ward in London. In a time before antiretroviral medications, it was populated by patients, often young men, facing a life cut brutally - and painfully - short. 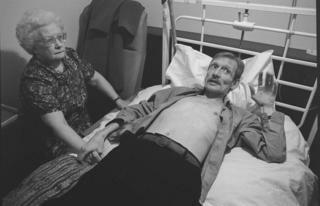 Six years later, Gideon Mendel spent time documenting the lives of four patients of the Middlesex's Broderip and neighbouring Charles Bell wards - John, Steven, Ian and Andre. 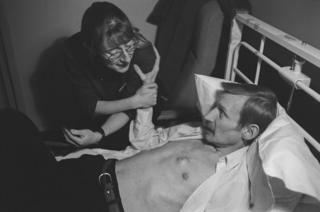 Mendel overrode the contemporary stigma surrounding HIV to take tender portraits of partners, friends and family comforting their loved ones. All of his subjects died in the year after these portraits were taken. Mendel's project aimed to move away from the representations in the popular media at the time, which he believes tended to show the horror of the illness. "The work is gentle and compassionate and loving, and the intention was to try and move away of images of people living with HIV as being emaciated, dying skeletons," he says. "I was trying to show relationships and show the love." Touch was an essential element of care on the ward, and Mendel captures the tactility of the nurses with their patients. 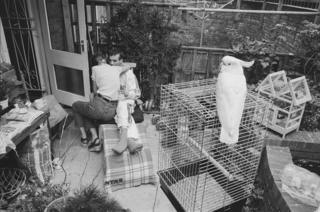 One image shows a nurse, Sarah, visiting Steven and his bird at home. 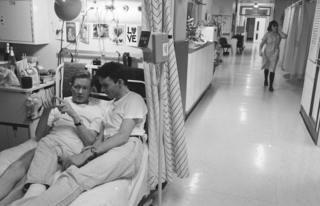 The pair had developed a close bond during Steven's time on the ward. After the project ended, Sarah became Mendel's partner and they have been together since. 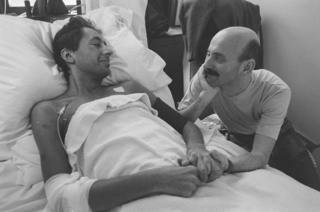 Mendel believes he captured the compassionate energy of the ward most fully in his image of John and Michael lying together on the bed. 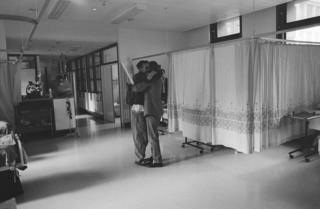 "For me, it's such an amazingly intimate picture in the anonymous context of the hospital ward," he says. The Ward by Gideon Mendel is published by Trolley Books. A selection of photographs can be seen on display at the Fitzrovia Chapel, London on Wednesdays and Sundays until 3 December.